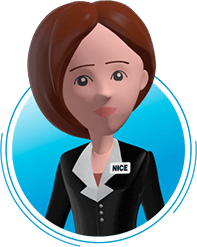 NICE Desktop Analytics is a highly unique and illuminating software solution aimed at capturing data and generating insights about employee behavior on the desktop. Lack of visibility into employee productivity is a major challenge for global enterprises today. The desktop forms a deep reservoir of rich and meaningful data with the potential to generate insights and measures around employee productivity scores, knowledge gaps and identification of inefficient processes. NICE Desktop Analytics provides clear visibility into the daily desktop activities of front and back office employees. In addition, the combination of NICE Desktop and speech analytics provides comprehensive insights, enabling a full understanding of the customer interaction for example, this combination can determine what the employee is busy with on their desktop during interaction silent or hold times. What’s more, our Automation Finder innovation leverages Desktop Analytics and AI technologies to accurately pinpoint the most optimal business processes to automate. Fast and accurate identification of the right processes to automate is a key element to ensure successful RPA deployments. Boost business efficiencies and success by employing a virtual workforce and leveraging cognitive technologies.